Coming off a 1–2 loss to third-ranked Wheaton (10–0) last Tuesday, women’s soccer (5–3–1, 0–0–1) was able to compromise in their UAA opener, tying Emory (8–0–2, 0–0–1) 1–1 on Saturday at Stagg Field. Although Emory is only ranked one position behind Wheaton in the latest national poll, the Maroons were confident going into Saturday’s match. Chicago’s confidence was tested early on. Just 44 seconds into the game, Emory found holes in the Maroons’ defense, leading to a goal inside of the box by Emory forward Charlotte Butker. Although the Maroons did not allow any more goals in the half, the momentum was still on Emory’s side. The Eagles out-shot the South Siders 5-2 in the first 45 minutes of action. The Maroons came out in the second half refocused, outshooting Emory 11-5. Despite having fewer chances, the Eagles gave Chicago a scare in the 55th minute, when forward Merrill Bachouras had an open shot against fourth-year goalkeeper Emma Gormley. Gormley came up with the diving save to keep the game at 1–0. About 20 minutes later, the Maroons had an opportunity of their own. Second-year Natalia Jovanovic was clipped inside of the box with the ball on her feet, drawing a penalty kick. Jovanovic was down after the incident and was limping when she stood up. She was able to recompose herself and sank the penalty in the corner of the net to tie the game at 1–1. After several missed opportunities by both teams, the game was even when the final whistle blew, calling for a “golden goal,” or two overtime periods of ten minutes each. The overtime periods provided both sides with many game-winning chances. In the fourth minutes of the first overtime, Emory midfielder Lee Bachouros sent a shot flying from way outside the box. Gormley underestimated the ball’s height, and it sailed over her head to hit the post. 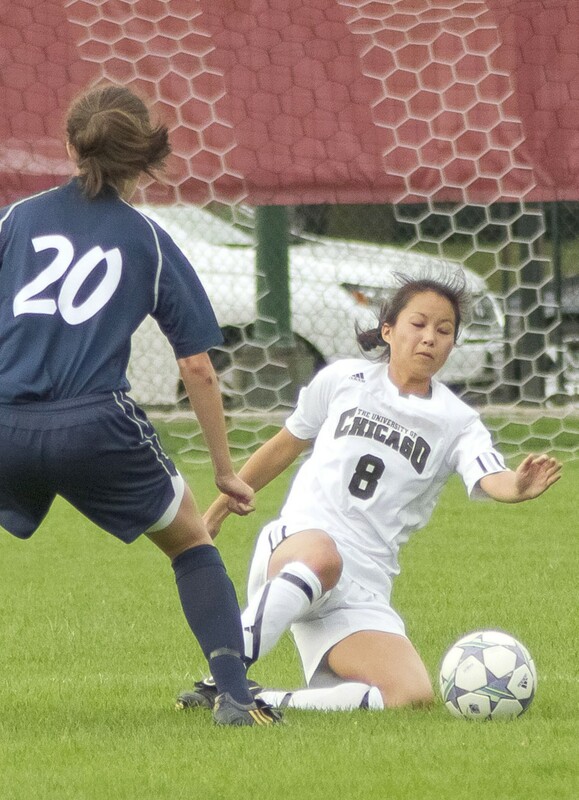 The game ended in a 1–1 tie, and gave both teams a record of 0–0–1 in the UAA. Derken said she was pleased with the comeback the Maroons made. The Maroons play against Carthage on Tuesday, October 4 at Stagg Field, 7 p.m.